Beef Prices at an All-Time High a Good Thing? In the recent months, commodity prices have soared to record highs, with the sharpest increase being in the price of beef. The reason for this increase is partially due to last summer’s drought, but it is much higher than most analysts predicted. This has begun to affect the profits of large restaurant chains such as Burger King, Wendys, and most importantly McDonalds. In early May, McDonalds announces that it would remove its Angus Third Pounders from their menu. The company said the removal of this burger was done to make room for other food options, but most experts agree that the profit margins are too low for beef items like these to remain profitable. This has resulted in McDonalds and other restaurant chains to begin to retool their supply chain to put a heavier emphasis on chicken products, which is more profitable than beef. McDonalds has already begun to roll out new items such as the premium chicken wraps. This will definitely be more costly in the short run, but with rising prices, and more health-conscious consumers, it is a good long-term strategy. With obesity at all time highs, and consumers becoming more health-conscious, this rise in beef prices could not come at a better time. Chicken is much healthier that beef, having significantly less calories and fat. With chicken prices being low, this could benefit both the restaurants and the consumer. This situation can be compared to gas prices hitting an all time high in 2008. Once prices hit the high, there was a sudden demand for more fuel-efficient vehicles, planes, trains, etc. They use less fuel, are much more efficient, and produce significantly less emissions that harm our environment. Similar to beef prices, consumers had no reason to switch to the better option until it became cost-effective. In any industries of this size, change has to be gradual. Switching from beef to chicken is easy for consumers. On the contrary, in order to fulfill demand, restaurants like McDonalds have to completely re-tool their supply-chain. Farms need to change their facilities to accommodate more chickens, processing plants need to change all their machinery, and restaurants need to change how they cook and prepare the final product. I personally believe that this will benefit both the profit-minded producer, along with the health-conscious consumer. The fast food world is changing, and these companies know that innovation is essential to adapt to the changing taste buds of consumers. What is your eating preference at these fast food chains? Do you think this rise in commodity prices is a good thing? Have you become more health-conscious? As the economy keeps changing, products’ prices keep are raising as well. A lot of the companies made a lot of changes to adapt to this economy. Not only supermarket and clothing stores are affected by the economy, so are fast food restaurants. The fast food industry are facing higher beef prices and McDonald’s have to change their menu to adjust to this change. McDonald’s have to decide what changes will keep costs low and balance customers demand. Recently, McDonald’s announced that they will have three new quarter pounders added to their menus, replacing the Angus burger. McDonald’s tried to control their cost of operating and total revenue, but not affecting the customers too much. Therefore, they made a decision to create three new Quarter Pounders to replace the Angus burgers. The product decision have met p roduct strategy options, there are different burgers produced with low costs. Also, they made a lot of concerns of these new burgers. For example, they understood the customers’ needs; they can attract more teenagers for the new innovation of quarter pounders. They also knew that if they raise the prices, they will scare customers away. Instead of raising the prices of their burgers, McDonald’s created and changed products to reduce costs and not affect customers demand. Moreover, the most concern of the new change is the price-conscious customers and traditional fast-food chains because McDonald’s are trying to meet fast-food market demand and provide high quality food like its competitors. In addition, “McDonald’s executives say the strategy is necessary to steal away customers at a time when the restaurant industry is barely growing” (Choi). They have met the Product Focus, one of the basic process strategies. 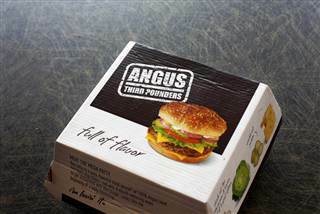 In product focus, products are in high volume and low variety, therefore, McDonald’s decides to bring Angus Burgers down and bring up Quarter Pounders to replace it. They did it not only for the price, but also the changes of value. Since Angus Burgers were the most expensive item on McDonald’s menus and it hasn’t made any newer variety of the Angus burgers, it would be a great decision to balance McDonald’s sales and profits. This strategy will also attract more customers to try out more new products other than quarter pounders. The value of quarter pounders is healthier and better than Angus burgers. McDonald’s provide healthier items on their menus to meet customers’ demand and new customers that are loyal to other fast food restaurants..
After reading the article, I believed that McDonald’s are not only making new quarter pounders or McMuffin to attracts customers, they are trying to change traditional fast-food chains to fast-food market demand which they can meet customers demand. As long as they can win back customers from other fast food restaurants, they can make anything that customers like and put them on menus. For example, McDonald’s in Hong Kong even put Chinese food on their menus, even though it is an American fast food restaurant. I think this is unbelievable. In the United States, McDonald’s put Mexican style McWraps and breakfast burrito on their menus. 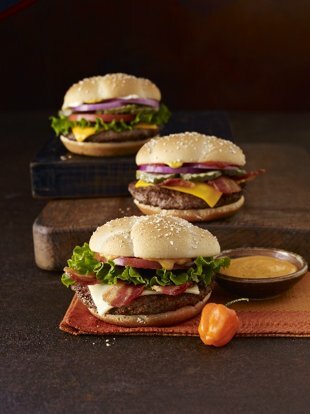 Do you think the three new quarter pounders can satisfy those customers who like third-pounder angus burgers? Would McDonald’s be affected if their menus contain items other than American style food?